Flights to Greece or Turkey can easily be booked over the internet, which usually means cheaper tickets and more options. This page will enable you to organize your own ideal flights and travel arrangements. For domestic flights within Greece you can best use Olympic airways and within Turkey the national Turkish airlines are recommended. Note, that if you located the cheapest tickets for a (domestic) flight on a portal site (that compares flights from all carriers) it might even be cheaper to book directly with the airline company in question, evading the commission of these portal sites. You can start booking flights the magical number of 330 days ahead, roughly 10 months plus a few weeks. Note that some operators make seats available via their reservations system not 330, but 332 or 328 days prior to the flight date, and that these first seats are usually very cheap. It is very worthwhile to book a flight the very day the seat become available - be sure to feed that date into your agenda! In Greece as well as in Turkey it is wiser to use a bus or dolmuş rather than a train, if domestic flights are not available. Click on the map to see the Greek ferry lines. Beside the obvious airport of Schiphol, also consider for example Düsseldorf or Airport Niederrhein. My friends and I have frequently used Aegean Air to reach the smaller airports in Greece. There are usually direct flights from either Manchester or Gatwick airports to Preveza - often only charter flights which serve from early May till the end of October. Expect to pay between €180 per person in low season up to €275 in high season. Direct flights to Athens in Greece or to Izmir, Bodrum, Dalaman, Antalya in Turkey are more frequent and cheaper. Bodrum is served by Bodrum-Milas (BJV) airport. If you can get a cheap flight into Kos, there is a daily hydrofoil to Turkey, and also from Rhodes to Marmaris. The airlines offering domestic flights in Turkey out of Istanbul Ataturk airport are these Turkish Airlines: thy.com, atlasjet.com, onurair.com.tr and Pegasus. Please note that Pegasus operates out of Sabiha Gokcen airport which is on the Asian side of Istanbul and only practical if you are already in Istanbul or on that side of the city. Look for a direct flight to the nearby Preveza airport or a domestic flight to Preveza via Athens. Via Corfu airport it takes about 3½ hours by taxi and ferry. Costs: 1 taxi /4 persons 80 EURO and ferry per person 3 EURO. Via Italy: ferries from the east coast of Italy - such as Bari or Brindisi - to Igounemitsa on mainland Greece, followed by a taxi ride to Lefkas (1.5 hours, 100 EURO). Direct flights on Kos via the following airlines: Norwegian Airlines, Freedom Flights, Sky Express, Fly Thomas Cook, Thomson Fly, Transavia, TUIfly, EasyJet, Condor, Avro, Air Berlin. Direct flights on Corfu via the following airlines: Air Berlin, Centralwings, XL Airways, flythomascook, Thomsonfly, Transavia, Wizz Air, LTU, TUIfly. Direct flights on Samos via the following airlines: Air Berlin, XL Airways, flythomascook, Thomsonfly, Sky espress, LTU, TUIfly. Direct flights on Santorini via the following airlines: Air Berlin, Condor, XL Airways, flythomascook, Transavia, MYAIR, Thomsonfly, Sky espress, TUIfly. The second best option is not Volos airport, but Thessaloniki further to the north. Unfortunately, this involves several hours by bus and a subsequent ferry ride from Volos port to Skiathos port. Direct flights on Skiathos via the following airlines: XL Airways, flythomascook, Transavia, Freedomflights, Thomsonfly. The hydrofoils and ferries will allow you to travel between Athens' Pireaus port and the major yacht charter bases of Paros, Poros, Syros, Rhodes, Kos and the touristy islands of Mykonos and Santorini. Both the Alimos marina - Kalamaki marina as well as Lavrion can be reached with taxis from Athens International Airport (AIA) "Eleftherios Venizelos". 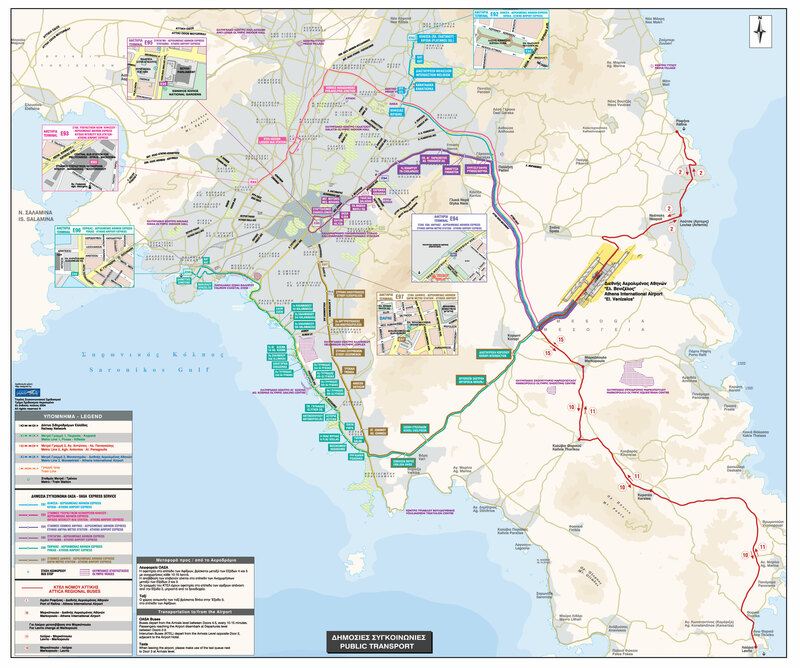 There is a convenient bus (X96 Piraeus - Athens Airport Express) that connects Pireaus port and the Airport; Kalamaki/Alimos is about half-way. Bus (KTEL Express Service Regional Buses 10 and 11) connects the Airport with Lavrion.